20 Things about 'Operation Overlord' - Maybe You Don't Know! » 20 Things about 'Operation Overlord' - Maybe You Don't Know! Operation Overlord was the code-name given to the Allied invasion of France scheduled for June 1944. The operation commenced on 6 June 1944 with the Normandy landings (Operation Neptune, commonly known as D-Day). A 1,200-plane airborne assault preceded anamphibious assault involving more than 5,000 vessels. Nearly 160,000 troops crossed the English Channel on 6 June, and more than two million Allied troops were in France by the end of August. The Allies failed to reach their goals for the first day, but gained a tenuous foothold that they gradually expanded as they captured the port at Cherbourg on 26 June and the city of Caen on 21 July. A failed counterattack by German forces on 8 August led to 50,000 soldiers of the German 7th Army being trapped in the Falaise pocket. The Allies launched an invasion of southern France (code-named Operation Dragoon) on 15 August, and the Liberation of Paris followed on 25 August. German forces retreated across the Seine on 30 August 1944, marking the close of Operation Overlord. Overlord had built into it the movement of a total of 3 million men in 47 divisions, moved by 6000 ships with aerial cover provided by 5000 fighter planes. That it was such an overwhelming success (with major casualties only occurring at Juno and Omaha Beach) is indicative of how well planned it was. Many soldiers landing on the beaches were wearing pyjamas under their battle dress. Lieutenant Herbert Jalland, of the Durham Light Infantry, said he and his battalion at Gold Beach wore them to stop backpacks chafing. Writer J.D. Salinger was one of thousands of US soldiers landing at Omaha Beach. As well as provisions and weapons, he was carrying six chapters of his unfinished novel Catcher in the Rye in his backpack. 2,700 soldiers from the UK were either killed, wounded, went missing or were captured during the D-Day landings. Meanwhile, in the Houses of Commons, MPs debated changing the term "charladies" to "cleaners". During the drop at the first liberated village, Sainte-Mere-Eglise, American paratrooper John Steele's parachute got caught on the church spire. For two hours, Steele hung there playing dead before being taken prisoner by the Germans. Today, a dummy paratrooper hangs from the spire in his honour. Lieutenant James Doohan of the Winnipeg Rifles was saved by his silver cigarette case when he was shot in the chest on D-Day. It did not stop the shot to his hand that caused him to lose a finger. Doohan went on to play Scotty in Star Trek. While on camera, he always tried to hide his injured hand. While the term “D-Day” is most closely linked to the Normandy landings, it in fact means the day on which a military operation begins – allowing the date for an operation to change without military planners having to change all the dates in their plan. The day before D-Day was D-1 and the day after was D+1. 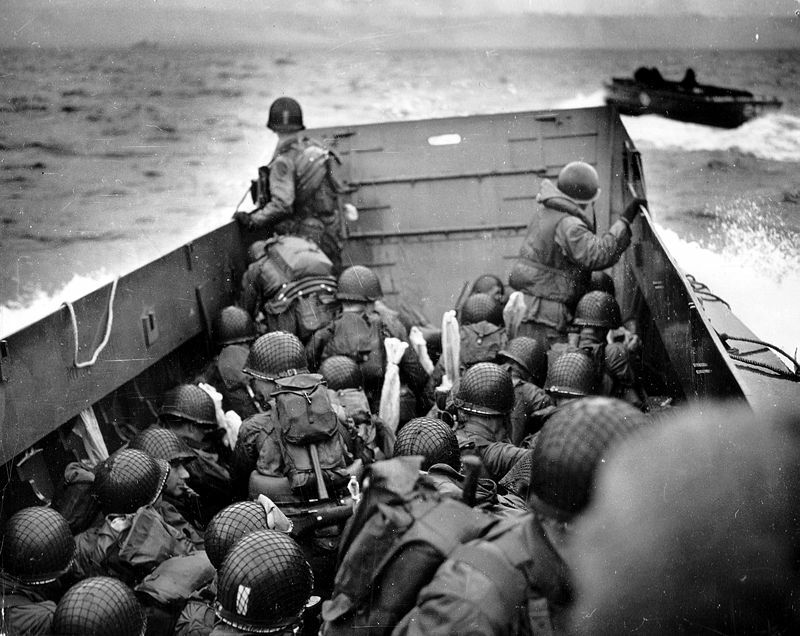 D-Day was originally planned for June 5 1944, but it was delayed by stormy weather. Thanks to intelligence operations to misdirect the Germans, even Hitler believed the "real" invasion was to come at Pas-de-Calais down the coast and the Normandy landings were merely a cover. Scottish meteorologist Group Captain James Stagg was appointed chief meteorological adviser to Eisenhower and persuaded him to delay the launch to allow for better weather. This decision saved the lives of thousands of soldiers although rough seas still hampered landings and the RAF struggled to bomb German fortifications through cloud cover. In order to maintain the secrecy of the plan and build-up to D-Day, strategists used a series of code names and acronyms. "D-Day" meant the date of the operation, while "H-Hour" was the time. "Bolero" signified the build-up in Britain. "Operation Overlord" was the the name for the overall invasion plan, and "Operation Neptune" was the name of the seaborne invasion. "Ham and Jam" were the signals indicating the bridges at Benouville and Ranville were secured by Allied forces. The first news report of the D-Day landings came from Gustav, an RAF homing pigeon released by the Reuters news agency correspondent Montague Taylor. Four pigeons, including Gustav, and one dog - an Alsatian called Brian - received the PDSA Dickin Medal for their life-saving actions. Andree Auvray was a fearful and heavily pregnant 18-year-old before the D-day landings. In an attempt to escape being killed by a bomb, she and her new husband slept in a ditch at her farm while keeping a small suitcase of baby clothes in case she gave birth in the trench. She gave birth 13 days later, in her dining room and her farm was transformed into a makeshift hospital for wounded civilians. On the morning of D-Day, Rommel was blissfully unaware of the invasion and was absent from his HQ at La Roche-Guyon, near Paris. He had returned home to Herrlingen in south-west Germany to celebrate his wife Lucie’s 50th birthday. He was later linked to a conspiracy to assassinate Hitler and forced to commit suicide. During the Battle of Cherbourg, the shell crashed through the port bow directly below the and entered the stateroom of Warrant Officer M.A. Clark, but failed to explode. It was later disarmed and brought aboard as a lucky charm. The devastating raids on Caen and other towns and villages in Normandy are still problematic for the French. Some feel the suffering of civilians has not been properly taken into account. Around 3,000 died on D-Day. Richard Dimbleby, the father of BBC journalists David and Jonathan, led the team of BBC war correspondents who reported on D-Day and the liberation of north-west Europe. He was the corporation's first war reporter and the first correspondent to enter Bergen-Belsen concentration camp. One of the flagship vessels of the naval operation was HMS Belfast. The vibrations of the ship’s gunfire during D-Day were so powerful that they cracked the crew’s toilets. She is now one of only three remaining vessels from the bombardment fleet. The exact timings of the landings were decided using tide-prediction machines. By 1944, British mathematician Arthur Thomas Doodson had identified the exact time the landings should take place (H-Hour) and that D-Day should fall between 5 and 7 June.